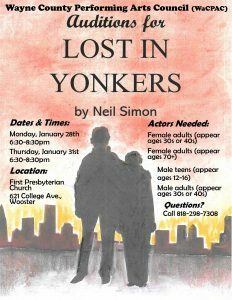 WaCPAC is holding auditions for our upcoming production of Neil Simon’s “Lost In Yonkers,” directed by Samuel Gonzalez. Performances will be held March 29-30 & April 5-7, 2019. The play tells the story of the Douglas family and their annual Christmas Eve dinner, which is interrupted by two men who rob a neighborhood store and find themselves in need of a hide-out. The bumbling thieves and the dysfunctional family interact, keeping the audience in stitches while celebrating the true meaning of Christmas. 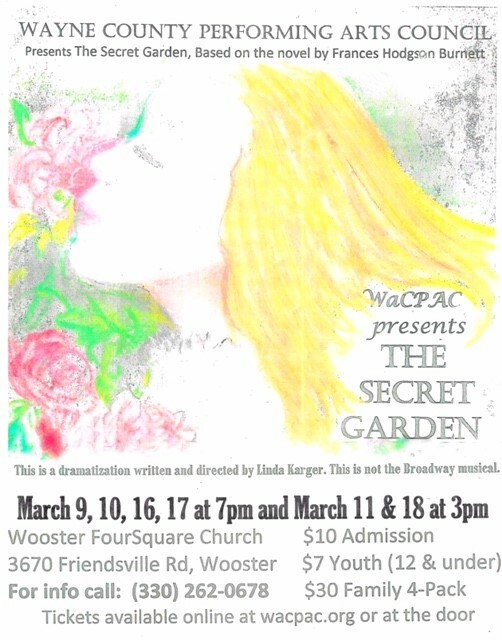 WaCPAC’s spring show will be “The Secret Garden” which Linda Karger has dramatized from the book by Frances Hodgson Burnett. Auditions will be held on Thursday, December 14th from 7 – 9pm and Saturday, December 16th from 10 – 12pm at Wooster FourSquare Church – 3670 Friendsville Road. Performances will be March 9-11 and 16-18. If you plan to audition, please prepare by reading the theme and character analysis, the play, and the audition script. They can be obtained by clicking on the links below. It would be useful to watch the movie to pick up the cadence of the accents, because we will be using the accents in the play, but the story line is significantly different in the movie. Thanks, and see you at auditions! 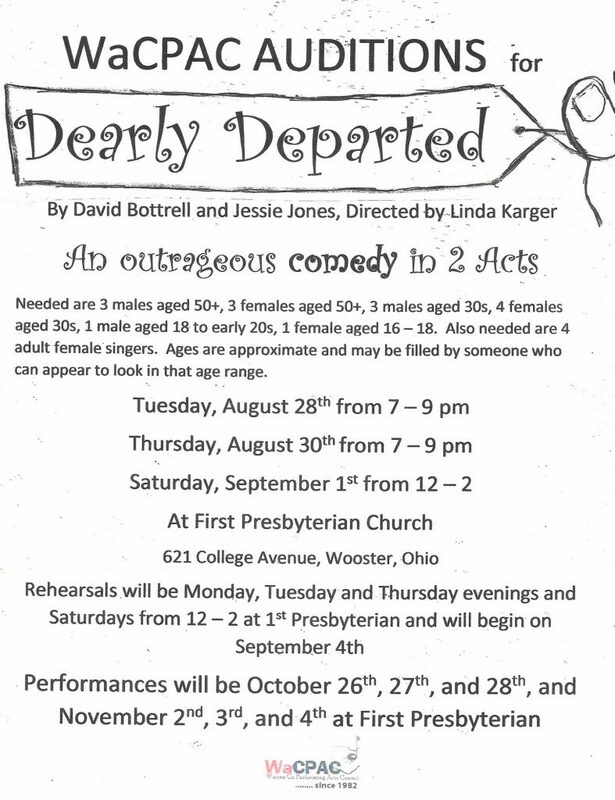 Wayne County Performing Arts Council (WaCPAC) will be holding auditions for “In-Laws, Outlaws, and Other People,” a delightful Christmas comedy, on Saturday, September 16 from 10:00 a.m. to noon and Monday, September 18 from 6:00 to 8:00 p.m. at Foursquare Church on Friendsville Road. Seven males and eight females are required for speaking roles in the show. There are some teenage…rs and many of the adults need to look mature enough to be their parents. We will also be looking for singers to serve as Christmas carolers called for in the show as well as before the show and during intermission. “In-Laws, Outlaws, and Other People” will be directed by Kay Anderson and will be presented on Friday, December 1, Saturday, December 2, Friday, December 8, Saturday, December 9 and Sunday, December 10, 2017. Those auditioning should come prepared to read scenes from the script. For further information about the auditions, call Laurie at 330-464-8939.